in New Zealand. At least they had faux newsprint. “Gotta try the fish & chips in New Zealand,” friend and former exchange student in New Zealand advised for my “must-do in New Zealand” list. 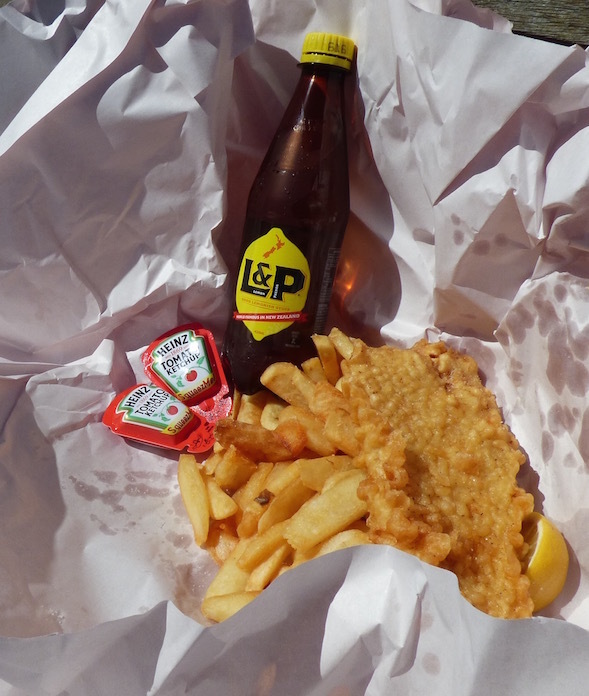 “Enjoy fish & chips on a beach (must still be wrapped in the paper)” is also #2 (but “in no particular order” on a 60-item list) from the iconic and prolific green and purple Jucy campervan crew’s recommendations. I confess – because fried foods are generally not my preference, decades passed since my last fish and chips. That includes my several trips to Australia, where fish and chips are also the rage. this many folks wanted fish & chips here, they were the real deal. As a Yankee, born and bred on the West Coast, I do recall with some nostalgia eating H. Salt. Esq. fish and chips a few times growing up. They came wrapped in newsprint, doused in malt vinegar. I’ve no doubt that sharp, greasy scent would get me salivating. Wayne, who spent some time “back when” in the Long White Cloud*’s culinary-cousin, England, also figured battered, fried, malt-vinegar-doused and newsprint-wrapped fish and chips were what we’d find in New Zealand. *New Zealand is also known as the Long White Cloud. Would modern New Zealand deliver (or – in this case – take-away) that same grease-embedded memory, worth calorifically insane, temporary departure from my usual raw, steamed, baked or sautéed eats? 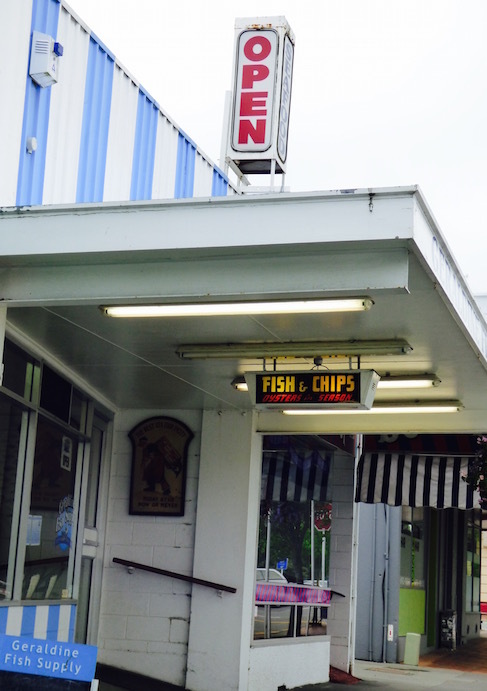 Where better to try fish and chips than in a fishing mecca? they’re extras. Akaroa Fish & Chips. 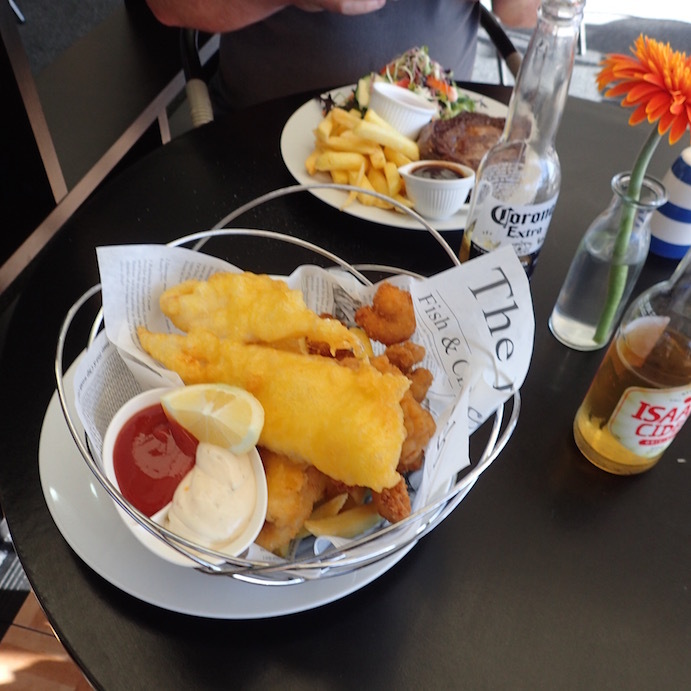 I gave New Zealand fish and chips my first go in Whangaroa, at a fishing club café, open the public. Not wanting to be pinned down, they called it a “seafood surprise.” The variety of seafood was impressive; then again it cost $25 NZD (~$17). It came wrapped in a faux newspaper, with some sauce upon request and no malt vinegar. I was stuffed, but unsatisfied. On the lookout, I discounted fish and chips places where they were a sideline, rather than the main meal. Seems most places selling fish & chips were Chinese greasy-spoon (chopsticks?) take-aways or the tired-looking fried foods cafes you sometimes find in small general grocery stores. I held out. Months passed. “Try them in Akaroa! That’s the place,” suggested some friendly Kiwis in the Christchuch area. Akaroa's a pretty little French-influenced town, though far less so than French Eastern Caribbean islands. It's popular with cruise ships; one was in town when we arrived. 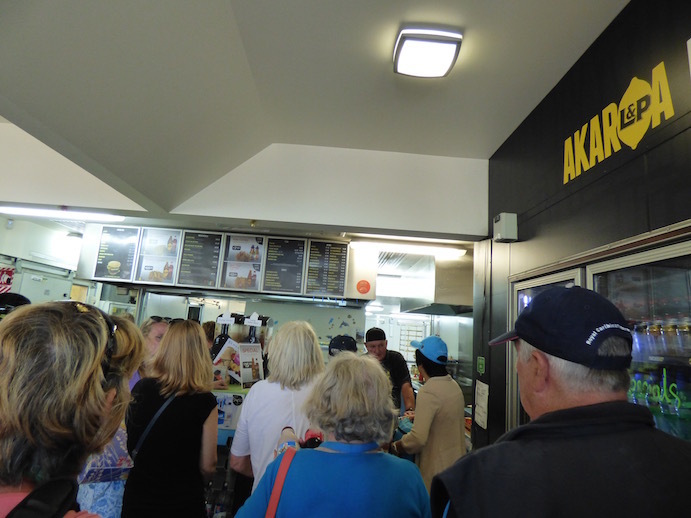 Akaroa Fish & Chips was packed. Going with "crowd mentality" I figured that many folks were a reasonable indicator their fish and chips were worth a go. If nothing else, their cod fish and chips with two sauces and a soft drink cost only $15 NZD (about $9 USD). 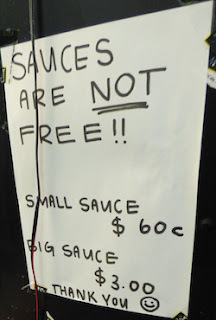 Normally sauces are either $.60 NZD each extra (tiny packets of ketchup or tartar sauce about the size you'd get free at McDonald's) or $3 NZD for a 4 oz can of sauce. Plus, I was curious about L&P, "Lemon & Paeroa, also known as L&P, is a sweet soft drink manufactured in New Zealand. 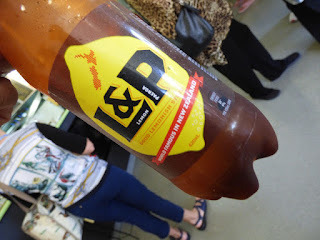 It was traditionally made by combining lemon juice with carbonated mineral water from the town of Paeroa and is now owned and manufactured by multi-national Coca-Cola," per Wikipedia. I chuckled over L&P's classic Kiwi humor slogan, "World famous in New Zealand." tasted like to me); my drink choice with Akaroa’s full meal deal. One again, no newsprint. No malt vinegar. Overall, Akaroa's fish and chips was... ok.
"If you asked, maybe they have malt vinegar," Wayne suggested. I countered that if I didn't see it out, that the norm is to charge extra for sauce, and more importantly, that with my extra-keen sniffer, that I didn't smell it, then I wasn't going to ask. Given Akaroa's mob of customers, I wondered, did they win any top ratings? Is my lackluster response due to missing malt? Disenchantment with fried foods? Or is there just lots better fish and chip makers? in all its greasy glory. Yes, I ate the whole thing. 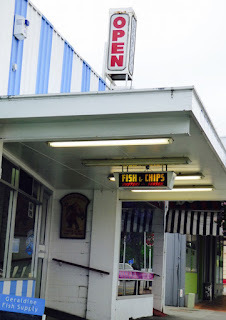 Googling "Best New Zealand fish and chips," I definitely didn't expect the fishing club in Whangaroa to make the list; the one in Akaroa didn't. Scanning the list and accompanying descriptions, none of the fish and chips favorites are wrapped in newspaper anymore. Nor is malt vinegar ever mentioned. While they may be better fish and chipperies than the two I tried, my sense is chasing a memory of malt vinegar doused chips in newsprint just doesn't exist anymore. Given that, I've abandoned my fish and chips quest. Well, unless someone can point me to place that still makes a mean fish and chips, that normally swim in a brine of malt vinegar and sport newsprint, not that that wimpy replacement, butcher paper. Then, I'll eat my words, calories and all. though it's a bit biased toward Auckland. After our near month long road trip blitzing New Zealand from Northlands to its Southernmost mainland tip, at Bluff, South Island, we're back. Currently we're in Whangarei’s Riverside Marina (S35.43.674 E174.20.17), doing some much needed boat work before we resume cruising.